Forex traders and anyone involved in trading are forecasting future prices. A trade can be only long or short, and the market will move up and down. Correctly interpreting future market moves is the recipe of successful trading. What makes successful trading and can it be constant? It is not possible to have one hundred percent winning trades. If a trader starts with this idea in mind, the trading account is doomed. There is no holy grail in trading, in the sense that there is not a formula to give only winning trades. Success in the art of speculation starts with understanding the market that is traded, the factors that influence prices, and ends with a money management system. One can be right in interpreting the direction of the market and still lose money because of poor money management. What can be considered a realistic approach? A realistic approach to trading is to use both price and time when making a forecast. Exiting a trade is as important as opening it, and the timing for both is even more important. While there is no formula for the holy grail in trading, a price and time approach is the closest concept to it. If a trader tells you that the EURUSD is going to 1.40, for example, but he is not telling you when this is going to happen, the forecast is worthless. Being able to place a time to a trade might seem to be easy, but it is not. There are trading theories that allow this, and the most powerful one is the Elliott Waves. The Elliott Wave theory is based on the idea that market is moving in impulsive and corrective waves. Impulsive waves are five-wave structures and corrective waves are three-wave patterns. Together, a five-wave move is corrected by a three-wave move, and they form the basis of Elliott Waves. Both impulsive and corrective waves must use the time element in a proper forecast. The Elliott Waves theory has clear rules regarding price targets that must be met. When something is a MUST, in trading, it means a rule is in place. Words or statements like “sometimes”, “almost always”, “most of the times”, leave room for error. When something MUST form, or something MUST follow or a target MUST be reached because of a previous pattern, the trade has more chances to be a profitable one. 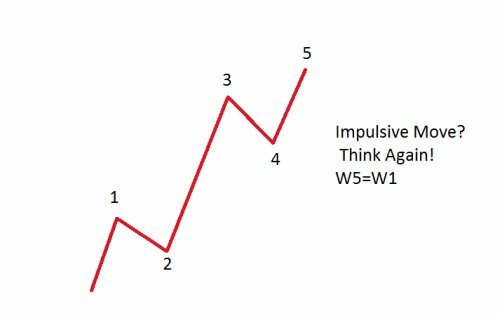 To give you an example, according to Elliott, the 1st and the 5th wave in an impulsive move are NEVER equal in price. This means, price-wise, that they need to be different. Such a simple rule, and yet it is overlooked by many traders. It leaves no room for error and just a look at possible impulsive move will tell you that it is a corrective one if the 5th wave equals the 1st. When searching the Internet for Elliott Waves counts, “impulsive moves” like the ones above are very common. In fact, this is a corrective wave, because it is not possible for the 5th wave to be equal in price with the 1st wave. The only possibility to have price equality between the two waves is to have a so-called failure. This is forming when the 5th wave fails to end beyond the end of the previous 3rd wave. But this is a rare pattern that shows major tops or bottoms forming. The Elliott Waves theory is full of price targets that are representing potential profit levels for a trade. How about time? Time is more important than price! This is the secret to master the art of speculation. If time is not confirming a pattern, the pattern is invalidated. Invalidation means the count is not correct and an error is a reason for this. The first reference to the time element comes from the principle of alternation. Alternation is referring to the two corrective waves in an impulsive move, namely the 2nd and the 4th wave. They need to be different for the impulsive move to be correct, and the time taken for the two waves is an important criterion. 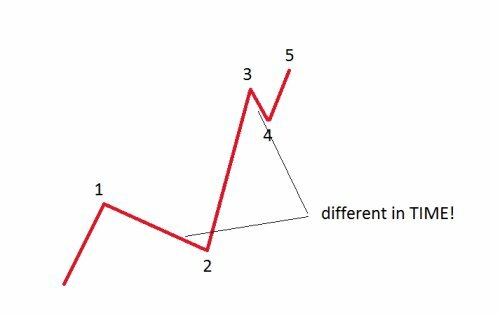 The image below shows the 2nd and the 4th waves being different in time, and this is something to look for in an impulsive move. But this is only one situation when time can be used and it is referring to interpreting a pattern, not giving a trade. Timing a trade is subject to different conditions. Elliott Waves has specific rules that make the difference between impulsive and corrective waves. If a move is not impulsive, it MUST be corrective. If a move is corrective, it can be either a simple or complex correction. How do we know what kind of a correction is going to for? The answer comes from the time element. A simple correction MUST be confirmed, and confirmation refers to time. Price action that follows a simple correction MUST behave in a specific way, or MUST travel a specific distance in a specific amount of time. Elliott practitioners are using candlesticks chart when doing a top/down analysis and the time taken for a pattern is expressed in candles. Therefore, if a triangle MUST be a simple correction, confirmation comes only if the price is breaking the b-d trend line (the most important trend line in a triangular formation) in a specific time. In other words, a trader can anticipate the possible end of a triangle and take a trade, but if TIME expires and the b-d trend line is not broken, the trade MUST be closed. The reason to close the trade comes from the TIME element, and not price. This is just a small example of how to incorporate time in a trading analysis and trading decision, but the conclusion of this article should be that forecasting a price without the time needed to reach the target is mandatory. Otherwise, there is room for interpretation and, in the end, the account will suffer over the long run.